McNary (2-5) is not the same football team it was a month ago. That was made clear last Friday night in Bend when after falling behind 12-0 the Celtics roared back to win 37-26. Senior Griffin Oliveira started the comeback, catching a touchdown pass from Erik Barker. Thanks to a Nigel Harris interception and touchdown on the final play of the first half, the Celtics took a 21-19 lead into halftime but they didn’t feel good about it. “We were not very happy with how we played in that first half, giving up three scores on defense, really being able to do whatever we want on offense but not having all 11 guys on the same page,” Auvinen said. Junior Walling, who finished with 133 total yards and three touchdowns, rushed for two touchdowns in the third quarter to extend the Celtics lead to 34-19. After Bend scored its only points of the second half on a kickoff return, Jacob Jackson made a 29-yard field goal. Barker completed 18 of 28 passes for 257 yards and a touchdown. Oliveira caught five passes for 68 yards. Jackson hauled in three for 67 yards. Walling also led McNary’s defense, finishing with 11 tackles and two sacks. Dyami Rios has six tackles and three sacks. Jackson and Robert Benson each added seven tackles. Devyn Schurr had six tackles and an interception. Bend entered the game 5-1 and No. 10 in the OSAA power rankings. The win was the Celtics second in a row after beginning the season 0-5. After allowing more than 500 yards on the ground to North Medford and Tumwater, McNary’s defense held Bend to 96 yards rushing on 28 carries. 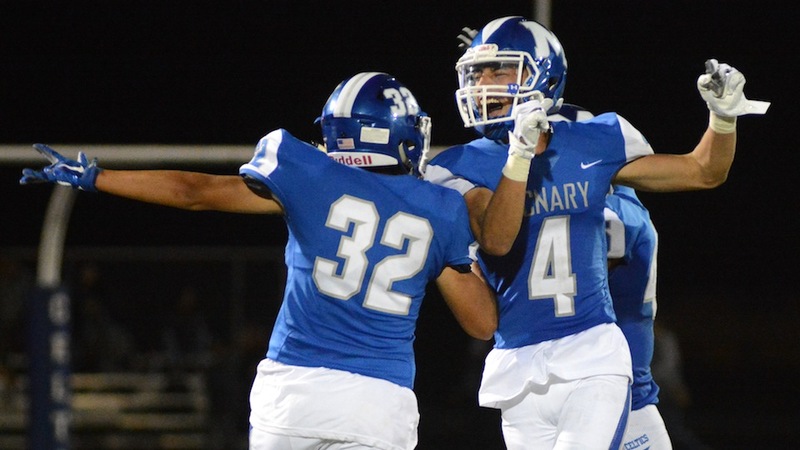 McNary will find out this Friday if it’s ready to take the next step as the Celtics travel to West Salem. Both squads are 2-0 in the Mountain Valley Conference. Slowing down the Titan offense, which features Simon Thompson, the 6A state track and field champion in the 110 hurdles, at quarterback, who passed for 475 yards and six touchdowns last Friday against Mountain View, and receiver Anthony Gould, an Oregon State commit who has 837 receiving yards and 12 touchdowns this season, will challenge McNary’s defense. Tight end Micah Pugh, who caught eight passes for 214 yards and touchdown against Mountain View, is also a concern. McNary should get a boost to its line as senior Wyatt Sherwood is expected back after suffering a concussion and neck injury on Sept. 7 at West Linn. “He’s pretty excited, which makes me excited,” Auvinen said. “Turn it in your hand so that you are looking at the opening of the container, if the opening is smaller than the rest of the container, it can probably be recycled,” Carlson said. Colored plastics that meet that condition are also fine. Recycling changes were the topic of the night during a Community Conversation hosted by the Keizer Chamber of Commerce on Wednesday, Sept. 26. Earlier this year, the area’s garbage haulers had to hit a reset button on what could be recycled because of changes on the international level. China, which had long been the largest buyer of American recycled goods, raised the standard for the level of contamination it was willing to accept. Local recycling facilities struggle to meet the new levels of acceptable contamination and it led to changes in what is accepted at curbside bins. Recently, area haulers have begun charging for non-recyclable goods still showing up in blue bins. Only empty, clean, and dry bottles and jugs larger than 12 ounces should be placed in the recycle bin. Steel and aluminum cans can still be recycled. No tubs (think peanut butter, spreadable butter, pasta sauce, or mayonnaise) or clamshells – even if they have the recycling symbol on them. No film plastics such as plastic bags or cling wrap. No cold storage boxes from frozen meals. No foil, aerosol cans or scrap metal. After decades of trying to get more people to recycle, and China’s history of giving the West Coast an easy way to offload recyclable materials, reversing the tide is likely going to require time and effort from all sectors, said Greg Dittman, operations manager for Valley Recycling and Disposal. “It’s a very complicated issue because producers want that little logo on their products and it makes us feel good. It’s a matter of shifting perceptions of recycling,” Dittman told the more than two dozen attendees. In that vein, it might require a return to mayonnaise jars made of glass which are easier to manage when they re-enter the waste stream. Such change will most likely require consumers putting pressure on companies to shift their practices. “Keep the end market in mind and what happens when [garbage and recycling] gets to its destination. We need to find our best selves to solve this problem,” Dittman said.